Medical doctors take ill like all mortals. They naturally become patients when they take ill and should seek health care. Their illness should be diagnosed and appropriate management was given. The process of making a diagnosis is rigorous. It involves careful history taking, general physical examination, and specific examination of the systems. Laboratory investigations are then used to fine-tune the diagnosis. Having made a diagnosis, the doctor gives his prescription/treatment, makes his documentation, and plans for follow-up. These components including history taking, physical examination, laboratory investigations, prescription/definitive treatment, documentation, and follow-up make up medical care. The quality of this medical care depends on the capacity of these components to achieve a specific goal. The goal, in this case, is effective and efficient treatment of the patient. This is quality care. Now, when the doctor becomes ill, it is expected that he/she takes the patient role and should be seen by a doctor to receive quality care that he/she gives to other patients. In practice, this does not happen. Medical doctors find it difficult to adopt the patient role; hence, they practice self-treatment or self-medication.,, Doctors advise their patients to seek professional advice when ill and not to indulge in self-medication, but when they (doctors) take ill, they ignore the advice they offer to their patients., Those that seek medical help from their colleagues do so informally., It is either on the phone or along the corridor or even in restaurants while eating food and drinking; hence, they receive very poor quality care. Medical doctors are aware that not seeking professional attention when ill can delay making appropriate diagnosis and worsen morbidity., The reason for doctors not seeking professional help from fellow medical doctors includes lack of time, having good knowledge of one's illness, considering one's illness minor, confidentiality issues, stigmatizing nature of illness, fear of showing weakness, or lack of medical knowledge.,,,, All these make doctors work through illness. The Nigerian doctors' knowledge of medical ethics is grossly inadequate. The medical directors may not know that it is unethical for doctors to indulge in self-medication. The Medical and Dental Council of Nigeria states that it is unethical for medical doctors to treat themselves unless the ailment is clearly minor or there is no access to a colleague. In a health-care institution, the head is the chief medical director. Every hospital, be it private or public, has a medical director. Policies emanate from this apex echelon. There are studies on doctors' health-seeking behavior, but few, if any, target this select group of medical doctors. They are the ones that make policies and manage the doctors working under them. If they have good health-seeking behavior, it will be easy to cascade it to the doctors under them; else, it becomes necessary to find a way of educating them on appropriate health-seeking behavior. This study aims to determine the health-seeking behavior of medical directors in Nigeria and the quality of care they receive. This is a cross-sectional study of medical directors in Nigeria. The Association of General and Private Medical Practitioners of Nigeria is an association of medical doctors in private practice in Nigeria. They had their National Executive Council (NEC) meeting in Lagos in February 2018. Each state was represented by at least two doctors (the chairman and secretary of the state branch). Almost all are medical directors of private hospitals. Self-administered questionnaires were administered to all the participants in the NEC meeting. They were more than 72 in number in attendance which made up of representatives of the state branches, the national officers, and other observers. Sixty of them were medical directors. Those that were not medical directors were excluded from the study. The sixty medical directors filled and returned their questionnaires. The sample size is calculated using the formula, n = [INSIDE:1]. Based on previous literature, the proportion of medical doctors that have appropriate health-seeking behavior is 0.195, and using the formula above, the sample size was calculated to be 60, exactly corresponding to the number of medical directors that filled and returned the questionnaires. Data were analyzed with International Business Machines (IBM) Corporation Statistical Package for the Social Science (SPSS) version 20 (Armonk, NY, USA). Numerical variables were summarized as means and standard deviations. Categorical variables were summarized as frequencies and percentages. Results were presented as tables. Approval for the study was obtained from the Ethical Committee of Chukwuemeka Odumegwu Ojukwu University Teaching Hospital, Awka, COOUTH/CMAC/ETH.C/VO1.1/003. Most participants are males, 58 (96.7%). The mean age of the participants is 58 ± 5.9 years. The youngest was 48 years and the oldest was 76 years. [Table 1] shows the characteristics of the participants. [Table 1] shows that only 14 doctors (23.3%) were first degree holders. The rest have additional postgraduate qualifications. They are made up of 38 (63.3%) postgraduate diplomates in family medicine, 6 (10.0%) fellows and 2 (3.3%) professors. More than half of the medical directors do not have personal primary care physicians that attend to their health needs. Reasons for not consulting their colleagues range from “illness not perceived as serious”, through “lack of time to consult another doctor”, to “not believing that another doctor can give the sick doctor better treatment than he can give himself”. Half of those that consult a doctor, at all, do so informally. Only half (30, 50%) of those that consult a doctor at all do so formally in a consulting room [Table 2]. All the medical directors self-prescribe drugs when they are ill. Most of them (46, 76.7%) also self-prescribe investigations and self-interpret the results of the investigations [Table 3]. 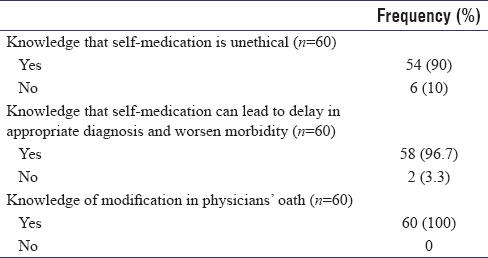 Most of the directors (54, 90%) are aware that self-medication is unethical and that it can delay making appropriate diagnosis 58 (96.7%). All the directors are aware that the physicians' oath has been modified to make medical doctors to realize the need for them to take good care of themselves before they will be able to take good care of patients [Table 4]. The medical directors in Nigeria are elderly men with a mean age of 58 years. There is a paucity of data on the age of medical directors to compare with this study. Onyekwelu got a younger age characteristic among doctors in Onitsha where 21.3% of the doctors were 45 years and above. This may be because the study was on doctors working in facilities registered with the Anambra State Ministry of Health and not on the medical directors themselves. 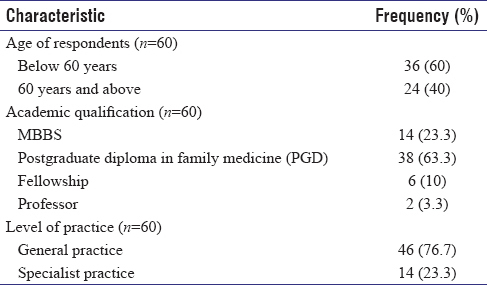 Most medical directors in the study are specialists in family medicine. From their training, they should know the importance of primary care. They are the doctors of the first contact in a health-care delivery system. Medical directors are expected to have primary care physicians and consult them when they are sick. They will be able to assess their ailments and treat or refer as appropriate. Almost half of the respondents do not have personal physicians. They prefer to self-treat when ill. Self-treatment is common, even in mental problems. Fawibe et al. documented that 19.5% of doctors in Nigeria had a regular source of medical care, meaning that 80.5% of doctors in Nigeria do not have a regular source of medical care. 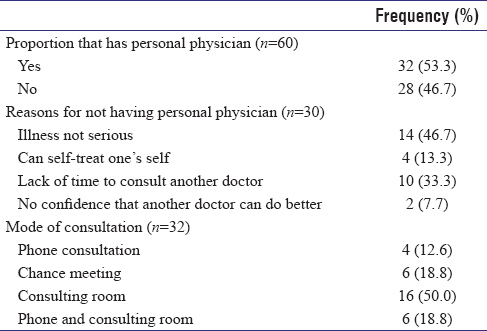 This is not because primary physicians are not available but, as in [Table 1], most medical directors that need medical treatment treat themselves because they think their illness is not serious while others do not have time to consult another doctor. This is similar to the findings of Onyekwelu J who documented that 59.0% of doctors in Onitsha in Anambra State, Nigeria, did not have personal physicians and 54.1% of them that did not have personal physicians were because it was inconvenient to have one while 23.0% and 14.8% were because of the perception that their illness was not serious and lack of time to consult another doctor, respectively. Two doctors (1.6%) from Onyekwelu's study did not consult another doctor because they did not believe another doctor could treat them better than themselves. This study agrees with these findings. It has been documented that medical doctors that have personal physicians consult them informally., This research found that 50% of consultations were done informally either on phone or at chance meetings or a combination of both modes. The remaining 50% of consultations were done in consulting rooms. All the medical directors self-prescribe drugs. This is in agreement with the findings of Onyekwelu among doctors in Onitsha where 100% of them self-prescribed drugs. In this study, most doctors self-prescribed and self-interpreted investigations. This is also similar to behavior of doctors in Onitsha. Doctors from the previous study know that this behavior is unethical. This study is in agreement with this finding since 90% of the medical directors studied have this knowledge. The Nigerian code of conduct states that it is unethical for a doctor to self-treat himself. Self-treatment is froth with danger. It can delay the making of appropriate diagnosis and worsen morbidity. The medical directors in this study know this. This is also similar to findings in literature. The physicians' oath has been modified to include the clause “I will attend to my own health, wellbeing and ability in order to provide care of the highest standard.” This means that physicians shall, first of all, give themselves adequate treatment when ill before they will be able to treat other patients. All the medical directors know this. This finding of excellent knowledge is not in agreement with the findings of Fadare et al. who found that medical doctors' knowledge of medical ethics is grossly inadequate. A doctor treats a patient first using his clinical training to objectively assess the patient. There has to be a professional distance between the patient and the doctor before the latter can objectively do the assessment else the findings will be subjective and biased. A sick doctor cannot distance himself from himself to objectively assess himself. He cannot diagnose his own ailment no matter how apparently unserious the ailment may seem to be. This doctor gives his best quality care to patients but receives the worst quality care when he is ill because either he informally consults a colleague or he self-treats himself. Self-treatment is common among medical directors in Nigeria. Half of those that consult colleagues do so informally. Most medical directors self-prescribe and self-interpret investigations. They are aware that this behavior is unethical and froth with danger of delaying appropriate diagnosis and worsening morbidity. They have excellent knowledge about the code of conduct of medical doctors in Nigeria and the inclusion of the clause that provides for a sick doctor to seek appropriate care for himself before treating other patients. The minimum sample size of 60 was just met. The other doctors that attended were not medical directors and were excluded from the study. The sixty doctors that attended and were included cannot be the entire population of medical directors in Nigeria. The study would have been more representative if the sixty doctors studied were to be a random sample taken from a much larger frame. However, the study gives a fair idea of the situation in Nigeria. Medical directors should include discussion of health-seeking behavior as part of their agenda during meetings. This will be able to make them internalize the culture of good health-seeking behavior and cascade it down to their junior colleagues in their establishments. Steffen GE. Quality medical care. A definition. JAMA 1988;260:56-61. Onyekwelu J. Self-prescribing habit among medical doctors in Onitsha, Anambra state. Niger J Gen Pract 2011;9:13-9. Tyssen R. Health problems and the use of health services among physicians: A review article with particular emphasis on Norwegian studies. Ind Health 2007;45:599-610. Montgomery AJ, Bradley C, Rochfort A, Panagopoulou E. A review of self-medication in physicians and medical students. Occup Med (Lond) 2011;61:490-7. Grantham H. Doctor as patient. Part 2: The realities of life as a patient. Aust Fam Physician 2002;31:179-81. Rennert M, Hagoel L, Epstein L, Shifroni G. The care of family physicians and their families: A study of health and help-seeking behaviour. Fam Pract 1990;7:96-9. Thompson WT, Cupples ME, Sibbett CH, Skan DI, Bradley T. Challenge of culture, conscience, and contract to general practitioners' care of their own health: Qualitative study. BMJ 2001;323:728-31. Rosvold EO, Bjertness E. Illness behaviour among Norwegian physicians. Scand J Public Health 2002;30:125-32. Rosvold EO, Tyssen R. Should physicians' self-prescribing be restricted by law? Lancet 2005;365:1372-4. World Medical Assembly. WMA Statement on Physicians Well-Being. Adopted by the 66th WMA General Assembly, Moscow, Russia October, 2015; 21 February, 2017. Available from: https://www.wma.net/policies-post/wma-statement-on-physicians-well-being/. [Last accessed on 2018 Mar 19]. Parsa-Parsi RW. The revised declaration of Geneva: A modern-day physician's pledge. JAMA 2017;318:1971-2. Fadare JO, Desalu OO, Jemilohun AC, Babatunde OA. Knowledge of medical ethics among Nigerian medical doctors. Niger Med J 2012;53:226-30. Medical and Dental Council of Nigeria. The Code of Medical Ethics in Nigeria. Issued at Lagos by the Medical and Dental Council of Nigeria in Consonance with the Provisions of the Medical and Dental Practitioners Act Cap 221 Laws of the Federal Republic of Nigeria 1990. 2004. p. 24. Fawibe AE, Odeigah LO, Akande TM, Salaudeen AG, Olanrewaju I. Self-reported medical care seeking behavior of doctors in Nigeria. Alexandria J Med 2017;53:117-22.